I have a gift checklist with me at all times during this time of year. I would NEVER purchase something without logging it in, NEVER (and I’m sharing the printable here with you). When I got home from shopping recently, I put the bags under the bed and I remembered that there were a couple of things in the closet from another day of Christmas shopping, and it made me think about everyone who doesn’t use the system I have for keeping track of Christmas presents. You can click the Image below or HERE for the printable, no need to enter a name or email. Just click and download the template. Honestly, though, you can just look at it, get a piece of lined paper, use the side of a book or ruler to draw 4 lines that will make 5 columns and write the headings for each column and take that out with you shopping. On this list, I have the names of the people I buy for and the appropriate amount of lines beneath their names. For example, I get several gifts for my grandchildren so I will have several lines under their names. There are five columns, and here are the headings: Name – Gift – Price – Wrapped – Where Hidden. The reason I have the heading for item costs is because I like to be sure I spend the same on each of my kids and also I want to be sure to stay on budget. I also carry an envelope with me. All the receipts from Christmas purchases go into it so that they don’t get mixed up with other receipts. It makes it super easy if things need to be returned, so be sure to have an envelope on you as well. Having this checklist and routine for my Christmas shopping has been such a lifesaver for me. It really helps to take away some of the stress we often go through this time of year. 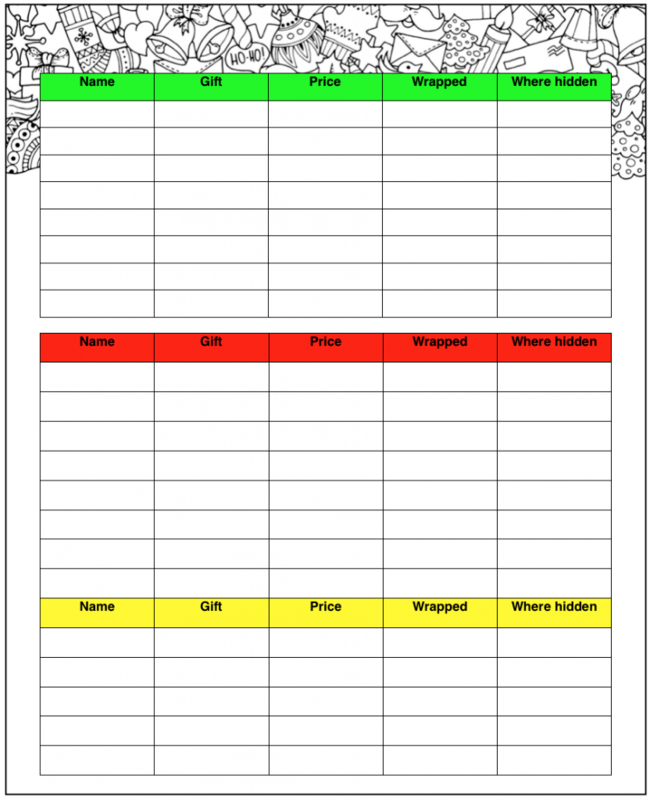 At this point, you probably have purchased gifts, but you can still fill out the printable with what you have. 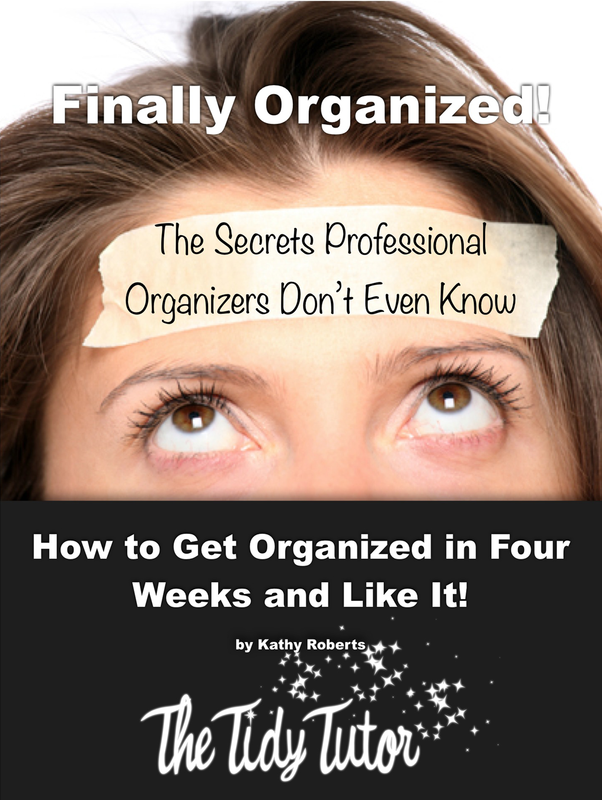 It will also help you get everything together and see what you have so far. This will be especially helpful to make sure you haven’t forgotten anyone or anything, to account for everything, and to see how you’re doing in the wrapping department. When I get home from shopping, I take the envelope with the receipts out of my purse and put them into the pocket of a divider in my 3-ring binder. In that section of the binder, I keep a copy of that master gif list as well as a list for any other Christmas projects I’ve got going on. For example, if I am hosting a Holiday Party or just to be sure I have everything I need for Christmas Eve and Christmas Day, I’ll have a separate list of what I’ve gotten already and what I still need to get. If you don’t use my Tidy Tutor system nor the 3-ring binder as I do, take the receipts envelope out of your purse and put it in a place you’ll remember, but getting yourself a 3-ring binder and keeping one on hand with dividers and loose leaf paper in it will prove to be helpful for all projects that come up in life. If you aren’t a part of The Tidy Tutor FaceBook page, CLICK HERE and like the page. There is a lot of action going on there. Now that Facebook has the ability for us to do live videos, I will be doing them regularly and you won’t want to miss out. Please let me know what you thought of the template and what you thought after using it!